Finally, we have our first oral history interview posted at our website! The interview is of Charles “Chuck” Svensson and his sister, Eleanor Carlson. 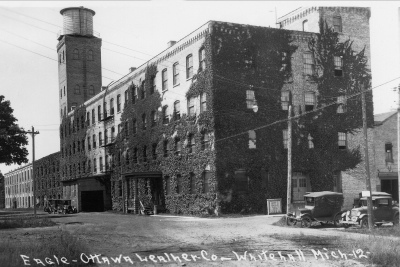 Their family had the White Lake Villa and later on, a campground, adjacent to the Whitehall Leather Tannery. It’s interesting to listen to the two remember with enthusiasm their childhood fun swimming in White Lake. They did note, however, that they stayed out of the water when it was “red” from the tannery dyes. The two also talk about their family’s lawsuit against the tannery – aimed at reducing the odor which they believed affected their business. They also mentioned how visits to city of Whitehall council meetings ended up getting heated and discussed how it felt to be in the minority in their community over the issue. The interview is less than 40 minutes long and very interesting. Do you remember the odor from the tannery? Did you ever see the lake turn red? Did you swim in White Lake often as a child? Were you a worker at the tannery and do you have a different viewpoint to share? Please read more about the White Lake Environmental History project at Restoring White Lake and share your feedback with us! While many of us are familiar with the environmental damage to White Lake caused by the chemical manufacturing era, there was another era that caused considerable damage to White River, the land it encompassed (the watershed) and White Lake. This was the logging era, 1837 — 1900. At the height of this era, 16 sawmills ringed White Lake. Logging drastically changed the White River and White Lake. Bark and debris sloughed off logs onto the river bottom, causing sedimentation. Straight channels dug in the coastal marshes to create the log boom area created further problems by decreasing the capacity of the wetlands to reduce nutrient loads, absorb floods, and filter water quality. See below for a historic photo of the original mouth of the White River, from about 1860 (provided by local history author Dan Yakes). You can see where the timber has been logged off, as well as the huge number of logs traveling down the river to be shipped across the Great Lakes for a multitude of uses. To find out more about our logging era, read “Logging the White, The White Lake Lumber Industry, 1837 — 1900” by Yakes, and Steven S. Demos, M.D. Questions? Your thoughts? Welcome to the White Lake Environmental History Blog! Thank you for stopping by! This is a blog for the White Lake Environmental History Project! I am ready to begin a dialogue on topics of community interest and I welcome your comments. What is on your mind about White Lake’s environmental history? What questions do you have? What issue or topic interests you the most? What would you like to know?